The Paris La Défense Arena (originally known as the U Arena) is a multi-use domed stadium that is located in Nanterre, which is a western suburb of Paris. It is one of the two multi-use domed stadiums to be built in Europe, along with Telenor Arena. The arena was renamed from U Arena to "Paris La Défense Arena" following a vote by its board of directors. For the 2024 Summer Olympics, in which the arena will host gymnastics events and commercially sponsored names are prohibited, the local organizing committee is using "Arena 92", a name that had been used early in the venue's planning process. The venue offers three separate configurations. In its rugby configuration, it has a nominal seating capacity of 32,000. For concerts, it is able to seat 40,000. Finally, a movable stand allows it to also be used for a variety of indoor sports, at various capacities, with a capacity of as low as 5,000 being possible. The venue also includes 33,000 square metres (360,000 sq ft) of office space, 300 student rooms, shops, including a club shop, a brewery and a gourmet restaurant. The arena was built by the French rugby union club, Racing 92, and replaced their previous stadium, Stade Olympique Yves-du-Manoir. The stadium was originally planned to open in 2014, but that date was delayed, due to local protests. It eventually opened in October 2017, although Racing 92 did not play their first home game in the new stadium, until they hosted Toulouse, on 22 December 2017. The stadium's working name was changed from "Arena92" to "U Arena"; referencing the configuration of the main stands, and the structure's shape, when viewed from the air, in November 2016. The name was changed a second time to the current Paris La Défense Arena on 12 June 2018. This followed a 10-year naming rights agreement with Paris La Défense, the company that manages the nearby La Défense business district. The venue was originally planned to have a retractable roof, but it was ultimately built with a fixed roof instead. The Rolling Stones were the first band to ever perform a concert in the stadium, closing their Europe-only No Filter Tour, with three shows, on 19, 22, and 25 October 2017. The arena's first rugby union match, took place on 25 November, 2017 between France and the Japan. On 11 March 2018, the French professional basketball clubs Nanterre 92 and ASVEL Basket, played each other in a LNB Pro A 2017–18 season game. The game had an attendance of 15,220, which was the highest attendance of any game in the league's history. Since 2017 it has hosted the Paris Motocross. ^ "L'Arena 92 inaugurée fin 2016" [Arena 92 to be inaugurated at the end of 2016]. Le Figaro (in French). Dassault Group. 2 December 2013. Retrieved 2 December 2013. ^ a b Moulin, Louis; Opoczynski, David (7 May 2018). 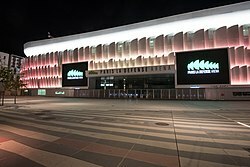 "«Paris La Défense Arena» : la U Arena de Nanterre se fait un nouveau nom" ["Paris La Défense Arena": U Arena Nanterre makes a new name]. Le Parisien (in French). LVMH. Retrieved 22 August 2018. ^ Aymard, Damien (4 December 2018). "Le naming de la U Arena est-il légal?" [Is the naming of U Arena legal?]. Acteurs Du Sport (in French). Infopro Digital. Retrieved 25 December 2018. ^ "Racing-Métro: La construction de l'Arena 92 enfin lancée" [Racing-Metro: The construction of the Arena 92 finally launched]. Midi Olympique (in French). Groupe La Dépêche du Midi. 2 December 2013. Retrieved 25 December 2018. ^ "L'Arena 92 sera livrée en septembre 2017" [The Arena 92 will be delivered in September 2017]. L'Équipe (in French). 2 May 2016. Retrieved 2 June 2016. ^ "Nanterre-La Défense : l'Arena 92 devient U Arena" [Nanterre-La Défense: Arena 92 becomes U Arena]. Le Parisien (in French). 15 November 2016. Retrieved 11 February 2017. ^ "La U Arena devient Paris La Défense Arena" [The U Arena becomes Paris La Défense Arena] (Press release) (in French). Paris La Défense Arena. 12 June 2018. Retrieved 18 June 2018. ^ Gottfried, Gideon (20 September 2017). "U Arena Opens With Stones Triple". Pollstar. Retrieved 25 December 2018. ^ "Current Boxscore". Billboard. Eldridge Industries. 129 (25). 11 November 2017. Archived from the original on 4 November 2017. Retrieved 25 December 2018. ^ Lutaud, Léna (4 December 2017). "Le concert Stars 80 à la U Arena : la foire à la saucisse" [The Stars 80 concert at the U Arena: the sausage fair]. Le Figaro (in French). Dassault Group. Retrieved 25 December 2018. ^ Sayagh, Jacques (9 June 2018). "Roger Waters en concert à Paris : la rage intacte d'un vétéran du rock" [Roger Waters in concert in Paris: the rage intact of a rock veteran] (in French). Groupe SIPA - Ouest-France. Retrieved 25 December 2018. ^ Bureau, Eric; Marolle, Emmanuel (23 August 2018). "Rock en Seine et Paris Summer Jam en guerre" [Rock en Seine and Paris Summer Jam at war]. Le Parisien (in French). Groupe Les Échos-Le Parisien. Retrieved 25 December 2018. ^ Binet, Stéphanie (14 October 2018). "A Paris, Booba triomphe sans jamais passer le mur du son" [In Paris, Booba triumphs without ever passing the wall of sound]. Le Monde (in French). Groupe Le Monde. Retrieved 25 December 2018. ^ "Paul McCartney : une joyeuse tempête de nostalgie à Paris La Défense Arena" [Paul McCartney: a happy storm of nostalgia in Paris La Defense Arena]. RTL (in French). Groupe M6. 29 November 2018. Retrieved 25 December 2018. ^ "Kassav' à La Défense" [Kassav' at La Défense]. La Gazette de la Défense (in French). 19 October 2018. Retrieved 25 December 2018. ^ "MARDI 18 DÉCEMBRE : MYLÈNE FARMER EST L'INVITÉE DU 17/20 RFM !" [TUESDAY DECEMBER 18: MYLENE FARMER IS THE GUEST OF 17/20 RFM!]. RFM (in French). Lagardère Active. 14 December 2018. Retrieved 25 December 2018. ^ Kaufman, Spencer (2 November 2018). "Rammstein announce 2019 European stadium tour". Consequence of Sound. Retrieved 25 December 2018. ^ a b Pineau, Marine (25 October 2018). "Pink en concert à l'U Arena, la date complète en moins de 5 minutes" [Pink in concert at the U Arena, the full date sells out in less than 5 minutes]. Virgin Radio (France) (in French). Lagardère Active. Retrieved 25 December 2018. ^ "Après Bercy, Bigflo & Oli s'attaquent au Stadium" [After Bercy, Bigflo & Oli tackle the Stadium]. La Dépêche du Midi (in French). Groupe La Dépêche du Midi. 16 December 2018. Retrieved 25 December 2018. ^ Foé, Nouma (2 November 2018). "L'interview Backstage de Patrick Bruel" [The Backstage interview of Patrick Bruel]. Chérie FM (in French). NRJ Group. Retrieved 25 December 2018. This page was last edited on 31 March 2019, at 21:08 (UTC).